As early as August 19,1834 townsfolk "resolved that a church be formed as soon as may be" and within the month the Congregational Church of Christ at Oberlin legally organized. Services were held first in a classroom and later, to accommodate a growing congregation, in Colonial Hall. Local Sabbath schools were established immediately in the colony and by 1835 students were encouraged to teach Sunday Schools in surrounding communities. In the big tent given by his New York friends, renowned evangelist Charles Grandison Finney, newly appointed professor of Theology at the Oberlin College Institute, held services on the square until the cornerstone to Oberlin's First Church was laid in 1842. Designed to seat 1800 (later 1600) this Meeting House was the largest auditorium west of the Alleghenies. Commencement exercises in August of 1843 were the first of many historic local and national occasions to take place within its sturdy walls. In a growing village where the college was gaining a world wide reputation, where the underground railroad had an active station, members of all faiths who moved to Oberlin were absorbed into this one congregation. By 1854 it boasted ten times the membership of any other Congregational Church in Ohio (a "Second Congregational Church" became necessary in 1860). It was designed as a Meeting House, serving parish and community needs, even housing the local fire trucks in the basement. The hand hewn timbers supporting the roof can still be seen. 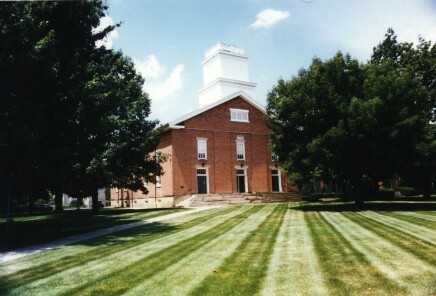 The Meeting House was slightly altered in 1962-66; in 1974 it was included in the national Register of Historic Places. Click here to return to "Churches of Oberlin". Click here to return to the historical preservation page on First Church.